the financial hub of South Africa. We are in the process of establishing a unique and innovative South African university. 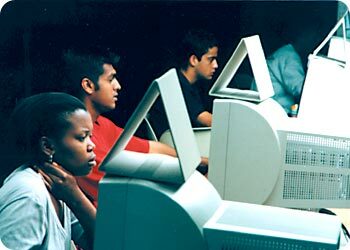 RAU University and the Technikon Witwatersrand will merge on 1 January 2005 to become the University of Johannesburg. This means students will become part of one of the very first comprehensive universities in South Africa. Characteristic of a comprehensive university is its offering of a broad spectrum of programmes with different entry requirements that include both general academic and career-orientated programmes. Students will be able to enrol for a range of qualifications, including certificates, diplomas, degrees and higher degrees. 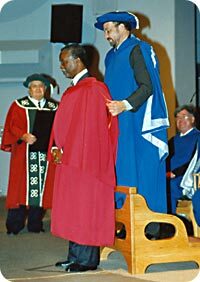 South Africa’s President Thabo Mbeki was capped an Honorary Doctor by RAU’s Chancellor. RAU was founded in 1967 with just over 700 registered students. Today, approximately 22 000 students represent the rich cultural and racial diversities of the South African population, and the University offers outstanding academic programmes, assisted by mixed modes of delivery. 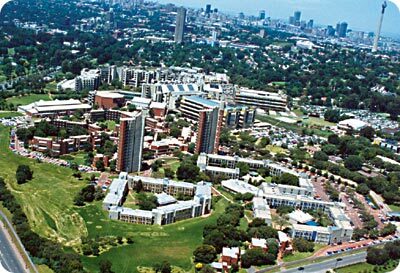 The modern, compact campus is situated in park-like surroundings in Auckland Park, Johannesburg, and is part of a cosmopolitan community. Johannesburg is the gateway to many great destinations in South Africa and the rest of Africa. Johannesburg is also the financial hub of South Africa and forms part of the Gauteng province, which is responsible for 48% of South Africa’s economy. Johannesburg represents gold, gold mine dumps and ‘big’ money, with the largest financial and industrial infrastructure on the continent of Africa. The applicant should contact the relevant faculty to enquire about specific entry requirements of their course of choice. The closing date for international applications for both undergraduate and postgraduate studies is 31 August of the year prior to the academic year in which a student would want to study. The University requires non-English speakers to take the internationally recognised English language competency test called IELTS (International English Language Testing System). The admission score is 6 for undergraduates and 7 for postgraduates (9 being the highest). If English is the first language of the applicant he or she is exempt from this test, but proof of English competency needs to be submitted when applying to the University. However, Afrikaans-speaking applicants are exempt from this condition. Students are responsible for taking this test themselves and for the costs thereof. A certified copy of the test results must be submitted with the application form and other required documentation when applying to the University. The IELTS test is administered by the British Council at centres all over the world. Visit the IELTS website for more details: www.ielts.org/. Unfortunately, special English language courses are not offered for foreigners by the University. Specific requirements for undergraduate studies. In order to study for a South African degree the equivalent of a South African senior certificate/high school certificate with matriculation exemption or foreign conditional exemption is required. Therefore an applicant needs to contact the South African Matriculation Board to have their school-leaving certificate evaluated. The evaluation certificate must then be submitted to the relevant faculty together with certified copies of academic records. Candidates who have written the ‘O’ level or equivalent examination and who are not writing any other school-leaving examination are not eligible for admission to the University. Application for postgraduate studies at the University must be addressed to the relevant academic department or faculty. An application must be submitted together with a motivation to study at the University, a curriculum vitae, a short research proposal, and complete, certified records of academic training. Results of the English competency test must also be submitted. Documentary evidence of previous qualifications needs to be submitted to the South African Qualifications Authority (SAQA). RAU enjoys a reputation of being a research-intensive university. Testimony to this is its per capita research output, which is constantly among the very best of all South African universities; the number of A-rated researchers it has delivered; the national and international recognition of RAU-initiated and managed journals; the number of bursaries, stipends and awards that RAU researchers have received; and the allocation of both national and international research funds amounting to several millions of rands. A parallel medium of instruction is followed, giving students a choice between English and Afrikaans. The University has also adapted a multi-modal teaching and learning strategy over the last couple of years. This entails different methods of access and presentation in teaching and learning events. The University has six faculties: Arts (Humanities) Engineering Natural Sciences Economic and Management Sciences Law Education and Nursing. Courses ranging from foundation, certificate programmes to undergraduate and postgraduate degrees and diplomas are offered. Doctoral programmes are offered in all faculties. The University is fortunate in that it has a custom-designed, multi-functional campus. The unique circular layout of the campus has the library, lecture halls, laboratories, auditorium, Student Centre and sports fields within a few minutes' walking distance of each other. The University's design and functional layout ensure a private and safe environment for students, staff and visitors. The key feature of the campus is accessibility. In focusing on the total development of its students, the University provides an excellent sporting infrastructure. It also offers a wide range of cultural and artistic societies, political and academic organizations and social clubs that reflects an expressive, energetic student body. The International Office provides support to international students and academics. Ongoing advice and guidance is provided regarding academic, social, accommodation and emotional aspects of student life. Student accommodation on campus is extremely limited. Applicants may contact the Residence Office with enquiries about available accommodation. Applicants will be informed in writing if accommodation had been reserved for them. As an alternative, it is recommended that applicants contact the private accommodation provider for possible placements close to the University. Anybody who is not a South Africa citizen or does not have permanent residence status in South Africa would need to apply for a study permit for the University. Applicants are required to apply for admission to the University first. Once the application is successful, a letter of admission status will be sent to the applicant, after which the applicant may apply for the study permit. The Department of Health in South Africa stipulates very urgently that all international students who wish to study at a South African institute for higher education are required to have health cover. Applicants are advised to take out a medical cover policy, preferably in South Africa, which will cover ALL medical costs while studying in South Africa. The International Office can advise applicants on a medical cover for international students. SADC and other African countries pay the prescribed tuition fee for local students plus a relevant, non-refundable international registration fee. Prescribed tuition fees plus a relevant, non-refundable international registration fee is payable. All postgraduate students from SADC, other African countries and all other foreign countries pay the tuition fee as prescribed for local students for the year, plus a non-refundable international registration fee.